Have you ever stopped to think about all the series you’ve read? Especially the ones you’ve finished. Well I just did. And guess how many I came up with? Two. There’s always a chance I’m missing some, but I think I’m pretty spot on. Merci Rayborn and The Hunger Games. Those are the only book series I’ve read from start to finish. It probably sounds crazy, but it really isn’t. I’ve written on here before about the length of series you’re willing to read, and I remember several people saying that four or five books is just too many for a series. I thought it was garbage back then and I still think so today. The majority of the series I read are 10+ books. Spenser. Bosch. Alex Cross. Jesse Stone. Elvis Cole. Alex McKnight. And several I started and never finished. Mystery writers tend to write long series, and I have no issue with that as long as the writing stays top notch. Do you have any idea how many aeries you’ve completed? Yay for finally doing a Top Five Wednesday video! The truth is that I haven’t liked any of the recent topics and I didn’t want to just do my own because then it’s just “five random things Wednesday”, which doesn’t really have a nice ring to it. Ha! Anyway, today’s topic is five fictional items I want. I knew I’d do this one as soon as I saw the March topics. But I soon realized that I don’t really read too many stories set in fictional places, which severely limits the number of fictional items I’ve read about. But fear not, in the process of recording the video I was actually able to come up with SIX items! Hehe. But they’re all from two series. Eh. Two from The Hunger Games because duhh. And four from that series with Hogwarts. But you won’t know what they are unless you watch! Which five fictional items do YOU want? If you can limit it to five. I couldn’t. And don’t forget that Top Five Wednesday is hosted by Lainey here. There’s also a Goodreads group. There are a lot of books adapted into films each year. Most are hardly worth taking note of, but others stand the test of time. Some remain popular long after their theatrical run ends. And others are immensely popular before and after movie adaptatations. But only a few books keep selling well in the used books environment. You would not believe how many of these books we get in at my store. It’s ridiculous. There’s a difference between the two series. THG sell, but we get SO many of them. I actually had no idea it was a book before I started working at Half Price Books. It’s one we see A LOT of. It isn’t exactly flying off the shelves. Similar to THG, these sell okay. But it’s definitely a book we see plenty of. So that’s my little list of popular books that became popular movies that don’t sell particularly well in a used bookstore environment. At least not in the environment I work in each day. Of course, there are opposites. Books that sell VERY well. It’s all a guessing game. Maybe I’ll have a post about those books in a couple of days. And it’s Funko. I usually just call them Pops, but I’m not entirely sure if others call them Pops or Funkos or what. But you know what I’m talking about. Those little 3 inch vinyl figures you’ve seen floating around everywhere. Well it turns out I LOVE them. My first encounter with them was a few months back. Late last year I wandered into a Hot Topic store one day for no reason. And I was met by a wall of Pops. A literal wall of them. I was drawn to a few classic characters I’ve loved since forever, but I wasn’t ready to buy just yet. And then my brother (who I was with at the time) gave me a JJ Watt Pop! for Christmas last year. But I still wasn’t really into them, although I haven’t taken mine out of the case because that’s what people do, right? Anyway, fast forward to last week. My store gets a few of these little guys in sometimes. But last week we got a Harry Potter and Hermione in stock. Brand new. They’re now waiting to be purchased on the 19th and 20th by me. Then I started looking online at all the different ones and THERE ARE SO MANY! But I was able to decide that I NEED the Katniss Everdeen and Jack Skellington ones. The regular Katniss and the regular Jack. But I know I want Ron and Dumbledore and Hagrid and Dobby and Peeta and Effie and Sally and Willy Wonka and the Master and SO MANY MORE. It helps that they aren’t overly expensive and I literally don’t spend money on anything else. Do you have any of these Funko Pops? I’m still not sure how I’m supposed to say that. Did you say Bookish Tattoo? I did. 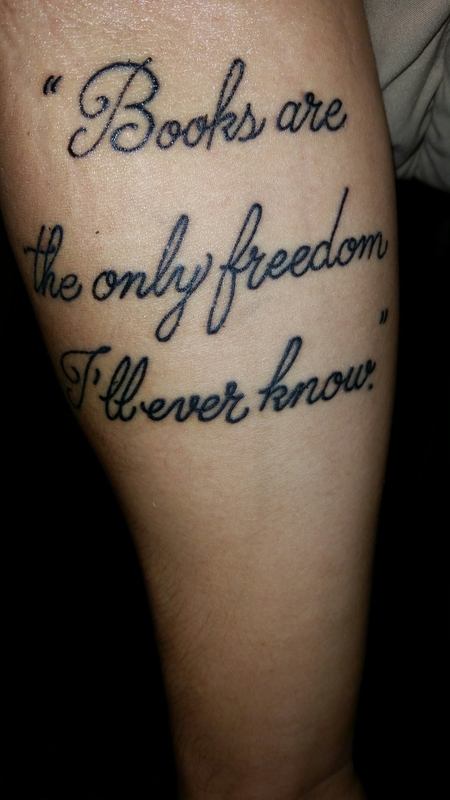 A number of you already know I want a few literary tattoos in the future. I want the deathly hallows symbol. But I REALLY want a mockingjay pin. I’ll get both at some point. Might even throw them together somehow. And some of y’all know I got my first book-related tattoo just a couple days after earning my degree to get me started on my writing journey. I got this in May 2013. It’s on my left forearm. And I just added another to my right forearm last week! Take a look. 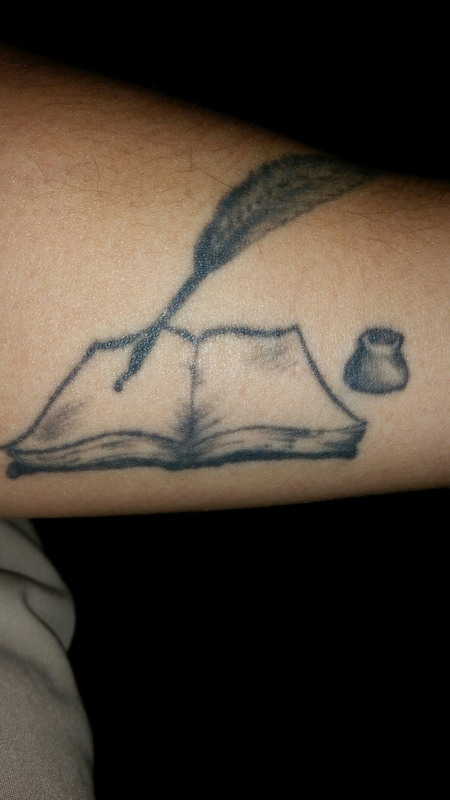 It’s been a long time since I originally wrote about literary tattoos here, so I’ll ask again. Do you have or want any? Tell me your thoughts on my new one? Everyone at work noticed immediately and seems to like it.